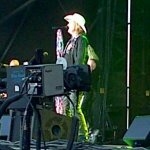 Def Leppard played the 9th show of the Summer Tour 2013 last night in Calgary, AB, Canada with 15 songs performed. The band played another short set at the Stampede Roundup 2013 with opening acts Cheap Trick and Sloan. 18,000 attended the private event which as the name suggests had a cowboy theme. 'BOTH' and 'Switch 625' returned to the show with the rest of the setlist pretty standard. Joe joined in with the festival theme and wore a cowboy hat during the encore. 'Rock Of Ages' and 'Photograph' were played as the encore. The band played on an outdoor stage with no full lighting rig, drum riser or video screens used. The next show takes place on 13th July in Quebec City, QC, CANADA - Live Blog?.